Open Cortana to see information it thinks you might care about. Cortana provides a lot of passive information, too, even notifying you when you need to leave to make an appointment on time. If you can’t use Cortana yet in your country, there’s a way to enable Cortana anywhere in the world. Cortana has a powerful built-in reminder feature, but there’s more you can do with these reminders than simply getting a reminder at a specific time. Use the Reminders icon or say “Remind me” to get started. You can create a reminder and have Cortana remind you about something at a specific time, when you get to a specific location, or when you talk to a specific person. You can also just say something like “Remind me to take my pill at 8pm” or “Remind me to buy milk when I get to [name of a store]” to instantly create a reminder. Cortana supports natural language search for files on your computer. 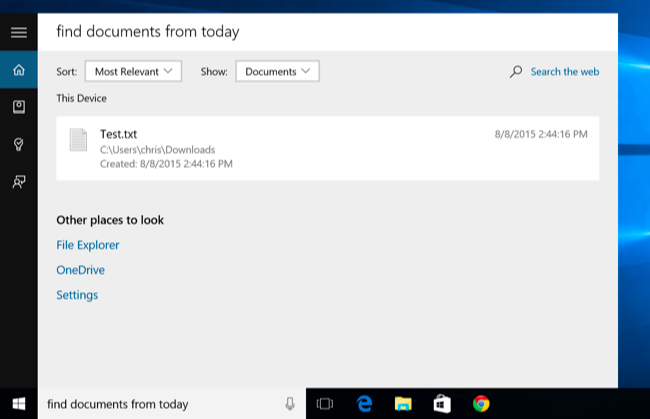 For example, you can ask Cortana to “find pictures from August” or “find documents about Windows” to find pictures from the months of August or document files related to Windows. It’s the built-in Windows search feature, but with more natural language capabilities. It’s easier to use than the old search operators. Like Siri, Google Now, and dedicated apps like Shazam, Cortana can listen to a song playing near you and identify it. 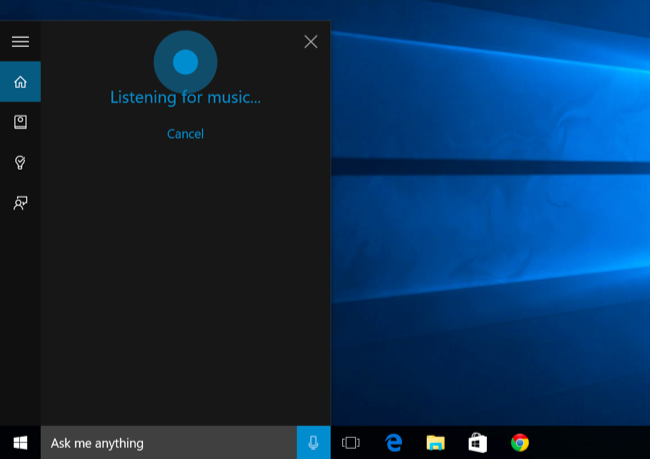 Say “What is this song?” and Cortana will use your microphone to listen to the music and match it to a specific song. Obviously, this works well with recorded music but won’t necessarily work with live music. Cortana is “powered by Bing.” When you ask Cortana for something it doesn’t know how to answer, Cortana will open your default web browser and perform a Bing search for it. Cortana respects your default web browser — even if it’s Chrome or Firefox — but won’t respect your default search engine and will always use Bing. 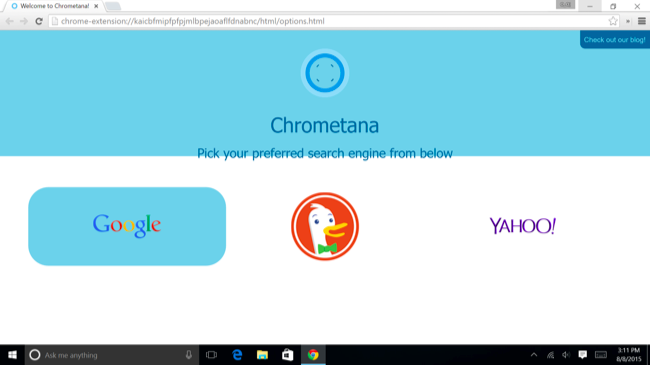 You can make Cortana use Google instead — or another search engine, like DuckDuckGo or Yahoo! — with the Chrometana extension for Google Chrome. 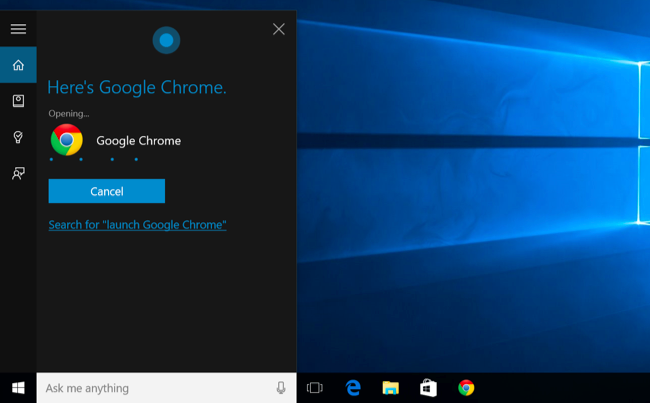 When Cortana directs Google Chrome to a Bing search results page, Chrometana will automatically redirect that search to Google or your search engine of choice, forcing Cortana to perform Google searches. This only works if you use Chrome as your default web browser, of course. Cortana can perform quick calculations, too. 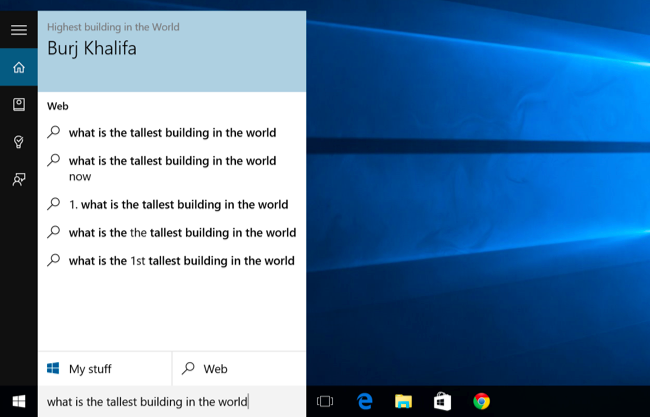 Remember that you can type into the Cortana search box, too — you don’t have to speak long numbers. 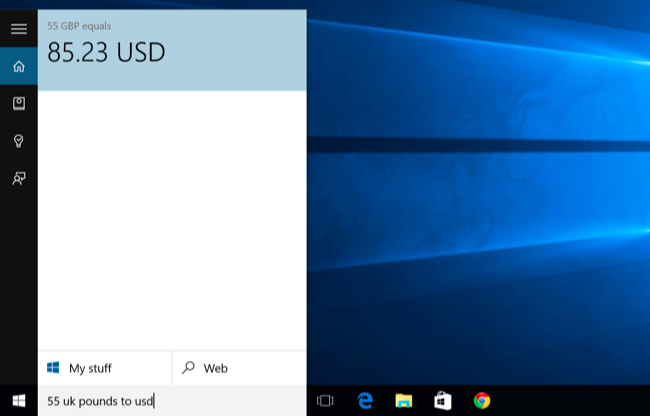 You can either ask cortana for the answer to a math calculation like “324234 * 34234” or enter a unit conversion like “55 uk pounds to usd”. This works for currencies as well as other types of units. 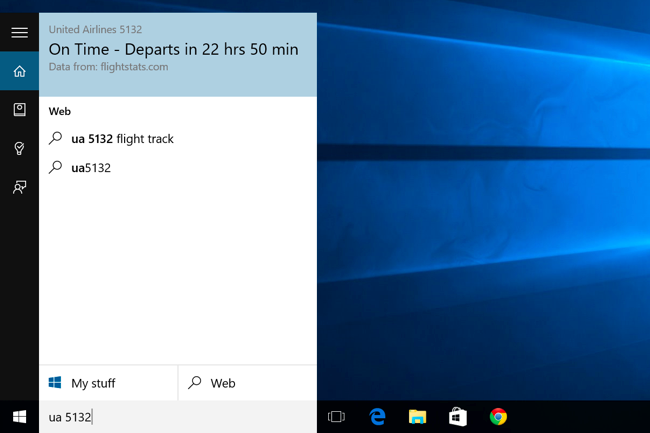 Cortana can track flights using the flight number and packages using their tracking numbers. Just enter a flight or package tracking number into the Cortana search box — you could just copy-and-paste it — to view the current status. 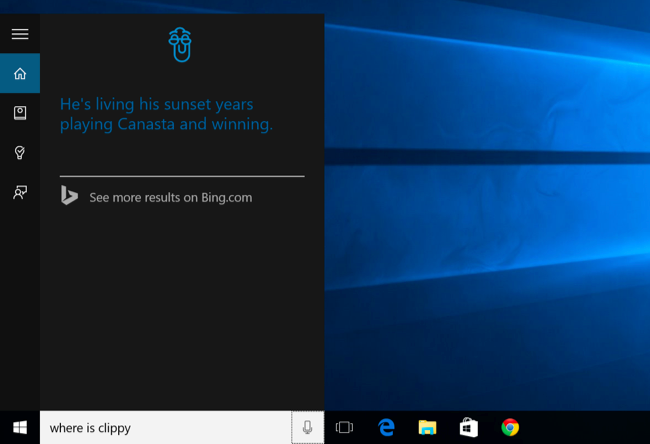 Cortana uses Bing to provide direct answers to common questions. This is similar to Google’s Knowledge Graph. For example, you can ask questions like “What is the tallest building in the world?” or “Who is the president of the United States?” to get an immediate answer. 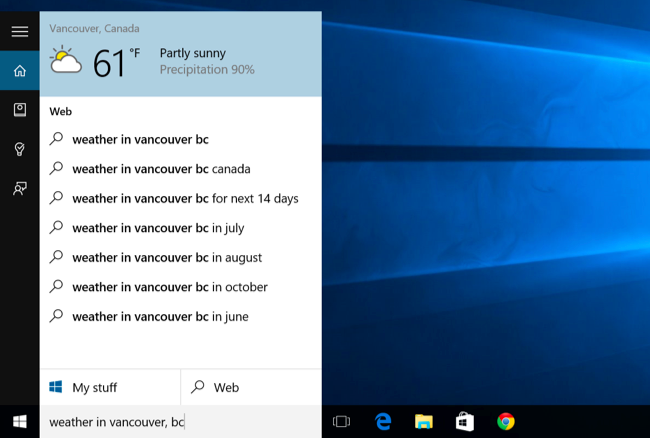 Use Cortana to quickly check the weather in different locations. “Weather” will show you the weather at your current location, while “weather in [location]” will show you the weather in another city. Cortana can respond with directions, too. Ask for “directions to [location]” and Cortana will open the included Windows 10 Maps app with directions to your location of choice. Cortana also supports alarms, not just reminders. 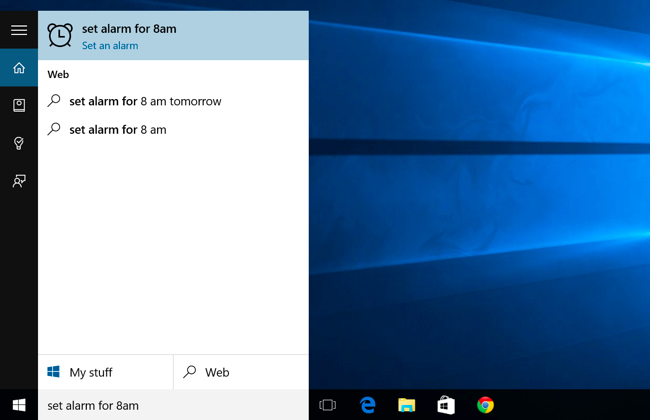 Ask Cortana to “set alarm for [time]” and it will create an alarm for you. The alarm here is saved in the Alarms & Clock app, where you can manage your alarms. 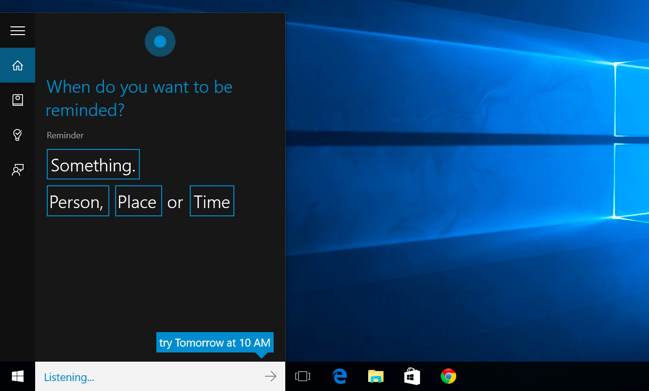 Cortana can launch programs for you. Just say “Launch [program name].” If you have the “Hey Cortana” voice shortcut enabled, this means you can just say “Hey Cortana, launch Google Chrome” to your PC and it will automatically open that app. Cortana can send emails using the built-in Mail app and the accounts you’ve configured there. Just say “send email” to get started, or say something more specific like “Send email to Pete” if that’s a person in your contacts. 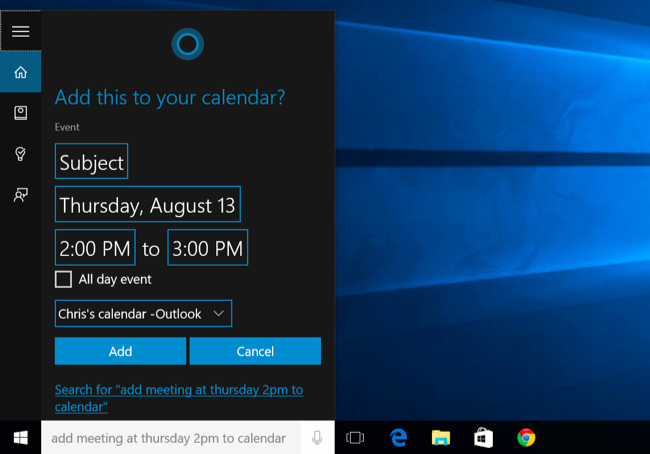 Cortana can also create calendar events. Just say something like “add meeting at Thursday 2pm to calendar” and Cortana will automatically fill in the information you’ve provided. You can also just start with “add meeting” and Cortana will ask for more details. 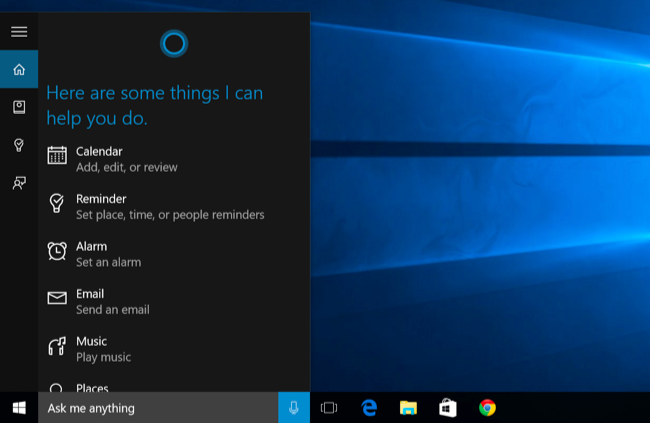 Ask Cortana for “help” and you’ll see a list of things you can do with Cortana. This will show you a more complete list. You’ll find some other options we didn’t list here. For example, Cortana can play music, view sports scores and provide predictions, and offer dictionary definitions and translations for words. Microsoft will likely be adding new features to Cortana and improving the existing ones in free updates going forward. Microsoft is currently bringing Cortana to Android and iPhone. When the Cortana apps launch for these other mobile platforms, you’ll be able to use Cortana on non-Windows smartphones, too. 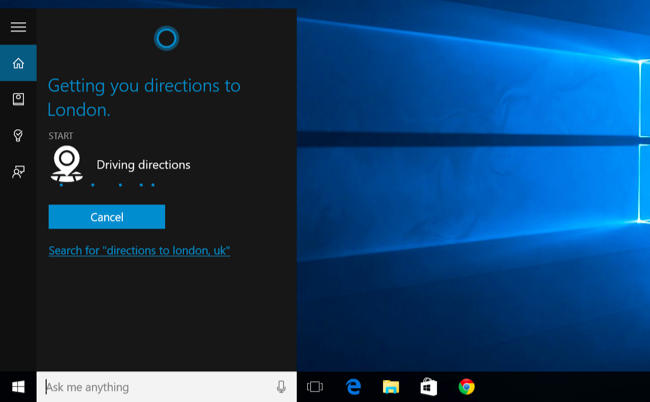 This means reminders and other Cortana features will follow you everywhere, too.